You probably know the “Hey Guy” guy. He/she is that person who just can’t remember your name. And, at any interaction with you, he/she pulls out the “Hey Guy!” greeting and then engages in a quick conversation before going on to more important or beneficial conversations with someone more relevant than you. This drives me crazy as I expect more from customer marketing at Apple. It started in college, worked its way into my professional life and has always grated on me. It’s basically admitting, “I don’t remember who you are, and I really don’t want to, but I don’t want to come across as rude”. For me, I’d rather you just ignore me and move on. In customer marketing, that’s a cardinal sin. 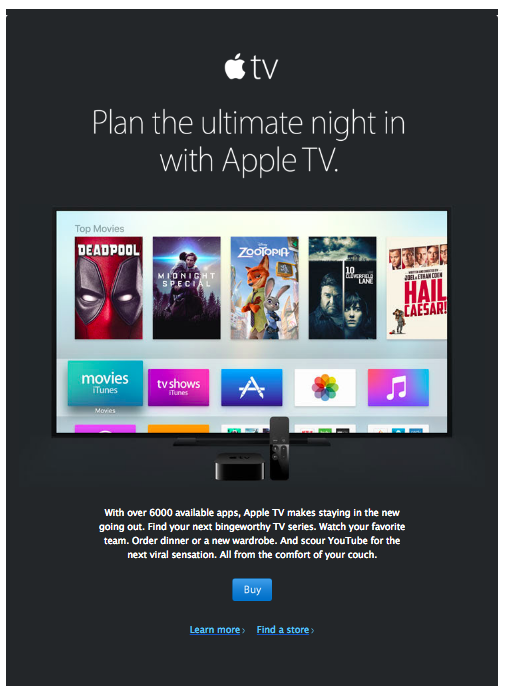 As an example, last week, I had another “Hey Guy” experience with Apple customer marketing as I received two identical emails from Apple about its new AppleTV model. The risk in continuing like this for Apple − and all other similar product-centric brands − is that the current customer marketing strategy and related messages will have a profound impact on my view of Apple. And as competitors like Amazon and Samsung continue to shift to put the customer first, the risk for Apple increases. Typically, poor emails are not a huge deal, but when a brand has the marketing technology caliber of Apple, we consumers expect more. And more importantly, as a marketing professional, it poses a great concern as “the brand of brands” is ignoring the fundamentals of today’s customer marketing best practices. If you have my data, use it. Recognize me. Talk to me as me, not “A Customer”. Apple, I trust you. I give you all kinds of information about me, willingly. And, as much as I expect you to secure my data, I expect you to use it to market better to me as a highly-engaged brand advocate. It should be what you do. It’s what your brand has been built upon. Come on. You’re better than this. Apple customer marketing should be the pinnacle of what we expect from brands marketing to us. Don’t be the “Hey Guy” guy.